The old paper mill across from David Rittenhouse's birthplace, Philadelphia, PA, 1889. Flip to Map of the properties in historic RittenhouseTown, Philadelphia, PA, 2008. 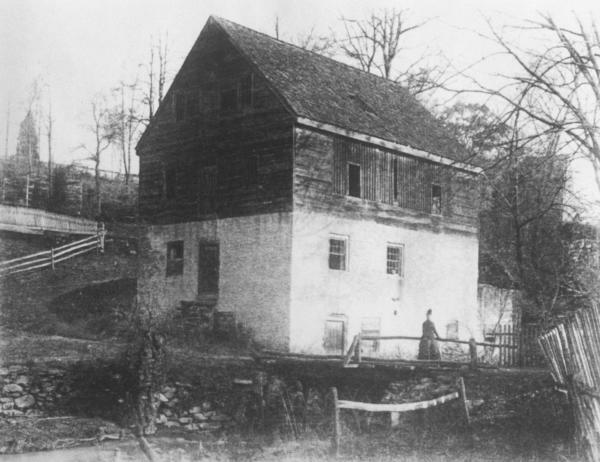 A German immigrant who became British North America's first Mennonite minister, William Rittenhouse also built the first paper mill in the colonies, outside of Philadelphia in 1690. After a flood took his first mill along Monoshone Creek in 1701, Rittenhouse and son Nicholas built a second one just downstream. Pictured here is the second mill with additions made in the mid-eighteenth century. This early Rittenhouse mill was demolished soon after Thomas Shoemaker took this photograph in 1889.